The Chinese and other Asian cultures celebrate New Year by gathering with their families much like Americans and other western cultures do at Thanksgiving and Christmas. The Chinese New Year falls on a different day each year. It’s a long standing tradition with solid history behind it. The celebration of the new year is also known as The Spring Festival. 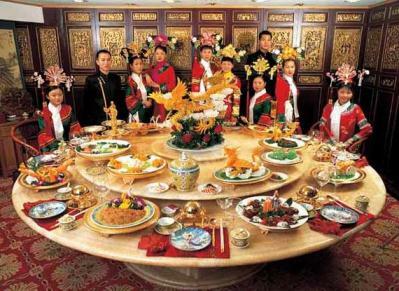 On New Year’s Eve the family gathers to bring in the new year with large reunion meals and firecrackers. On New Year’s morning the children are greeted with money given in red envelopes. They typically get two envelopes with crisp new bills inside to guarantee good luck. It is encouraged to wear new clothing in the color red and to greet every one with a phrase that wishes them prosperity and success in the New Year. 龔喜發蔡 Kung Hei Fat Choy! In traditional Chinese culture when the wife married, she became a part of the husband’s family and was no longer allowed to see her family of origin, except during the New Year’s celebrations, when she was allowed to return to her family home so that she could worship her ancestors and pay homage to her parents and elder relatives. This would occur on the 3rd and 4th day of the 15-day celebration when sons-in-law were to take their wives back to her parents’ home. This year, in preparation for the annual migration that takes place at New Year’s, the Chinese Railway Authority will put an additional 152 trains in service. The migrant workers in the cities will start making their way home between now and January 23, 2012. They will remain there visiting relatives and family for 10 days or more and then make the return trip home. Much of China’s working population comes from the countryside to work in the big cities on the eastern seaboard. The use of red in decorating houses, gifts and clothing will be prevalent. Red is the symbol for good luck in China, so during the Spring Festival there will be an abundant use of the color. There will be red lanterns hung in the homes and the courtyards and families will decorate their windows with red characters proclaiming good luck, prosperity and long life. The children will receive their香港寶 hong bao (red envelopes), with gifts of new money, and will be dressed in red clothing as well. The meals have regional flavors and usually contain chicken and pork with fish being served as a part of a specific meal and not eaten fully. The chicken and fish are served intact to encourage prosperity for the new year. Long noodles will also be served in most areas signifying longevity. 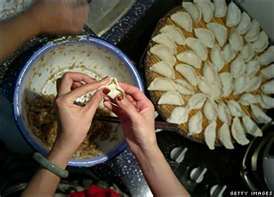 Chinese dumplings, also known as pot stickers, are also indispensable for the new year celebration. Bring your families into Yu’s Garden Chinese Restaurant and let us help you celebrate a family reunion in the best traditions of Chinese New Year’s. Besides calendars, bookmarks, and red chopsticks, we have special red envelopes for kids ten and under available during the whole month of January. Of course, you may want to have your own Chinese New Year celebration at home: you can call or fax your order in, or you can order online. We can also deliver within five miles from the restaurant. This entry was posted in Chinese New Year, Special Occasions, Year of the Dragon and tagged 15 days long, 60137, Beijing Chinese Restaurant, celebrations, Chinese New Year, 龔喜發蔡, family gtherings, Glen Ellyn, IL, Kung Hei Fat Choy, Money, prosperity, red envelopes, Year of the Dragon, Yu's Garden Chinese Restaurant. Bookmark the permalink.